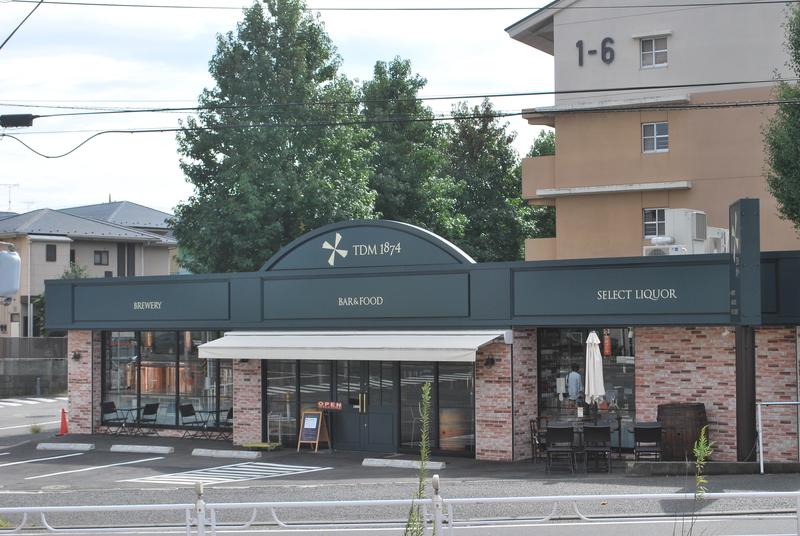 Located in the small commuter town of Tokaichiba in West Yokohama, TDM1874 has been brewing for just over a year (when this article comes out) and has already seen interest growing in both its beer and its head brewer, George Juniper. Sales of their beers, which started in their own brewpub, have spread across Japan and can now be found in bars in the Kanto region, Niigata, Osaka and Kyoto. Interest peaked with a bronze medal at the International Beer Cup in September 2017, organised by BeerFes. TDM1874’s unusual name is an abbreviation of Ten Day Market 1874, which comes from the English translation of Tokaichiba (十日市場) and the year the company was founded. They originally started out as sellers and distributors of sake and shochu. The company now incorporates two liquor stores, and also an online shopping portal called Chouzaemon. The brewpub is the latest addition to the company, gaining its official brewing license in January 2017 and commencing production on the 27th of the same month – three months after Juniper joined the brewery. Perhaps a speed record in a land known for its snail-paced approach to bureaucracy. Juniper has had a long and varied career in brewing. He started out at Dark Star Brewing in the UK, a highly acclaimed brewery that has also spawned Burning Sky Brewery from one of its ex-brewers. He was studying at university in Brighton and homebrewing whenever possible (Homebrew in the UK, unlike in Japan, is completely legal), when a chance meeting in one of the Brighton pubs with one of the brewers from Dark Star led to a job offer and Juniper dropping out of university to work as a brewer there. But how did a British brewer go from one of the UK’s top breweries to a small brewpub in what appears to be the countryside of Yokohama? At this point, when we asked him, Juniper got a wistful look on his face. He originally came to Japan to test his Japanese language skills in 2009, having spent time back in the UK taking weekly Japanese classes. It was in Japan that he met Yoichi, one of the Kiuchi brothers who own Kiuchi Brewery, makers of Hitachino Nest Beer. He was offered a job, and after breaking the news to Dark Star, where he had been working for the past five years, he started at Kiuchi in 2011. The change in the roles was not quite what he expected, however, so he decided to move to Brimmer Brewing. With the help of owner Scott Brimmer, George’s enthusiasm for brewing and ambition to be a head brewer was invigorated. After a brief stint English teaching, Juniper’s friend Todd Stevens, owner of BeerCats, got in touch with him with an offer. Stevens was in contact with the owner of TDM1874, Kato Shuichi, as Kato’s daughter worked alongside him at Orca. Stevens had heard that Kato was looking for a brewer and recommended Juniper. An interview later and Juniper was hired as head brewer. When the brewpub opened in December 2016, there wasn’t any beer on tap as the license had not been obtained. So what did they do? As a favour, and thanks to Hitachino Nest helping to install and setup the brewery, all the taps bar one were Hitachino Nest beers. The other tap? Asahi Super Dry – a gateway beer to getting people in the pub and then trying out the other beers on tap. Within a few short months, those Hitachino Nest beers moved aside for the TDM1874 batches, with a porter, British Best Bitter, a pale ale, a strong pale, and an IPA all going on tap. The porter has only seen the light of day twice now – Juniper mentioned it’s difficult to get people drinking beer that isn’t light-coloured. The British Best Bitter, also known as BBB, has proven a big hit with fans of British beer. It has a strength of 4.5% and is a great example of a high-end session beer in the UK, with lashings of caramel malt flavours along with a nutty floral bite from the British Challenger and East Kent Goldings hops. The IPA, now on its sixth iteration, has gradually gone from a British-based style of maltiness to a more American style, with the hops playing a much bigger part of the profile. The second iteration was a personal favourite of mine, with its usage of Azacca hops, and like most well-respected domestically-brewed IPAs, it didn’t last long on tap. The strong pale ale has Centennial as the bittering hops and Mosaic as the base for the aroma hops in the latest batch. When it comes to brewing beers, nothing is off-limits to Juniper. In the beginning, he had to think about what beers would sell at the brewpub – which is considered to be the base of sales. As time has passed and his reputation for brewing beer has become more widespread, however, he has been able to branch out. “Yokohama Lawnchair”, a session IPA, along with the Leitungswasser Koelsch – with a slight joke at a friend’s expense – proved that Juniper is more than adept at brewing non-British styles of beer. In the future, there are plans for a kettle sour – a style of beer that makes a sour beer quicker than the current style brewed in Belgium. Yokohama has a plethora of Japan Agriculture farm shops, where you can purchase cheap, locally-grown produce, so it was no surprise to hear George talking about making a pumpkin beer. It’s not a style of beer that I’m fond of (though not quite Abashiri Ryuhyo-bad), but it’s a style that is growing in popularity. Grown with locally sourced pumpkins known as kabocha, it’s a full-on American pumpkin ale, with plenty of cinnamon, ginger, and nutmeg along with a smooth creamy body. This collaboration came about due to the close nature that TDM1874 has developed with the local community. While there are no plans for a daikon radish beer, George did perk up with thoughts of fruited saisons and the possible combinations available to him with this new avenue of adjuncts. At the time of writing, there have been 16 different beers brewed on the system – a 400L system with space for double batches – something that has already proven useful in the short time the brewery has been in business. With only one brewer (though Juniper does have an assistant now), the hard work of cleaning, ordering, and brewing is down to Juniper himself. That means long days, starting at 10 in the morning and sometimes lasting until 8 at night on brew days. Cleaning days require a meticulous amount of effort and scrubbing – someone has to clean all the copper. As mentioned, Juniper does have an assistant to help him out during busy times, such as during the cleaning and filling of kegs, but he is very much a hands-on brewer, ensuring every part of the brewery is up to his impeccably high standards – even during the Japanese summer months where it gets to over 40c inside the brewery. For those wondering about bottling of beers, there is a small four-bottle machine available to them. While it’s a labour-intensive process, with about 600 bottles per day their maximum output, some of the TDM1874 beers can be found in the bottle shop or on their online store. The pale ale, IPA, and also their Nashigose have all been bottled up. It’s a long process, so don’t expect them on every batch of beer, but the bottles have proven to be popular. TDM1874 hasn’t been around for long but they’ve had a fantastic year overall. If you’re in the Yokohama area, then why not pop over for some local beers and relax. You never know, that person sitting next to you might even be George and before you know it, you’ve lost the evening to some excellent beers and learnt a lot about the brewing process.